I’ve actually been taking a little vacation from cooking. That’s so bad! For the last 3 days my family has been eating take out or cereal. But I needed a little break to re-charge my battery. Plus I was avoiding the grocery store, so I didn’t actually have much to cook with. I actually made it to the grocery store yesterday though, so after my little break I’m totally excited and looking forward to my menu for this week!! Should be filled with tons of yummy food 😉 But I wanted to quickly post this recipe that I tried a couple of weeks ago. This drink turned out pretty yummy. I would substitute the cranberry juice for like a raspberry cranberry juice to soften the taste of the cranberries just a little. I was also thinking as I was drinking this that it would be so amazing as a float instead of just a drink. I mean as a fruity drink it’s good, but if you added a couple scoops of vanilla ice cream to the mix I think it would make this amazing. If you do decide to make into a float, remove the ice from the recipe. Enjoy!! 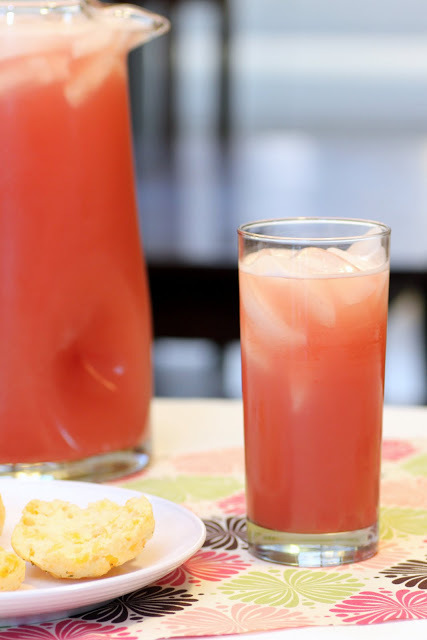 Combine all of the ingredients in a pitcher and pour into two glasses over ice. Be sure all of the ingredients are cold when combined.